Finally, RBTH reporter Artem Zagorodnov gets out of the car and crashes a wedding party on the ice of Lake Baikal, all in a day’s work. I'm sitting inside my cabin overlooking Lake Baikal's largest Island, Olkhon, as I write this –warm and fresh after a Siberian banya (my first shave in almost a week) with a cup of hot tea provided by the welcoming staff. The sun is slowly setting on the opposite side of the sky. Peace and rest at last – and with most of the way behind us. Lake Baikal – the “Pearl of Siberia,” the world's deepest freshwater lake, with dozens of endemic species to its name (including the famous Omul fish, which I blame for my illness last time I visited the region after it was served every day for breakfast, lunch and dinner in various forms). 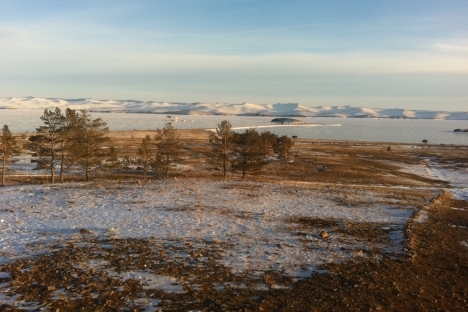 Baikal contains more water than all five of the Great Lakes combined, and one-fifth of the world's fresh water supply! Its mysteries and charm have appealed to many, including James Cameron, who dove to its depths in search of new life forms. All of it lies frozen before me...and soon our adventurous and determined group of enthusiasts will cross it by car. Thanks to my team's zealousness and ability to stay awake for days on end, we were the first team to arrive at this “rest base” run by a private company on Lake Baikal's shore. There are dozens of them scattered around Baikal, as well as on its 20 plus islands. After a light breakfast and being shown my bed, I read three pages of “Near Death in the Arctic” before turning off like a light bulb. I even had the luxury of my own room. I remained in a deep sleep for almost five hours before one of the caretakers was kind enough to wake me up for banya - I'd been looking forward to it since the start of the trip. I didn't have the traditional birch branch for beating my pores and I was restricted to only an hour, so this banya was reduced to more of a hot shower and shave. It was also the first time I'd gone alone. Normally a group of guys will go and beat each other with branches. Oh well. When I visited Lake Baikal in the summer of 2008, I predicted, along with a British diplomat I met along the way, that within five years the area would have Hilton hotels and be overrun with commercial development. We were lucky to visit it while it was still wild then, we concluded. There's no Hilton hotel however, and I wouldn't say its being overrun by tourists. But some modernity has crept in – the roads have improved, there are more companies and guest lodgings catering to all kinds of tourists, both Russian and international. Electricity and plumbing can be found at many of the bases now, including ours. I made my way across the ice at sunset to the giant tent pitched on the ice for a huge wedding party for five couples who were married today! The walk gave me a chance to try on the $10 rubber crampons I'd been talked into buying at a Moscow sportswear shop weeks ago. It turns out they do make walking on ice more convenient. I arrived to loud music, local buffet (the further east you travel in Russia, the bigger the “pelmeni” get until they start to resemble Chinese dumplings) and a bar made completely of ice outside. We congratulated the five couples who had just gotten married, and then proceeded to drink, eat and dance to the tunes of a rock band from Perm. Somebody had apparently set up a mobile banya adjacent to the giant tent and a hole for diving near the banya (the master of ceremonies warned people to try hard not to accidentally stumble into the hole in the darkness). When I went to examine it, I discovered the hole had a giant cross of ice above it and that religious men were making the dive as a sign of their faith (continuing the centuries-old tradition of Orthodox believers). While the idea of making a mad dash stark naked in front of filming journalists to dive into freezing water didn't appeal to me at first, my friend Tolya convinced me it was as good an occasion as ever to try it. Inside the banya, one of the men who got married today assured me it was his first time submerging himself into freezing water and that it didn't really feel cold. He added that the body doesn't have time to adjust to the sudden change in temperature. What the hell I figured – and ran into the water, doing the traditional three dips. Then I returned to the banya and did it all over again. The guy was right about the water not feeling too cold, by the way.